The NSE Nifty index too shed 44.50 points, or 0.38 per cent, at 11,544.60. The BSE 30-share barometer fell by 206.85 points, or 0.54 per cent, to 38,182.97 in early trade. 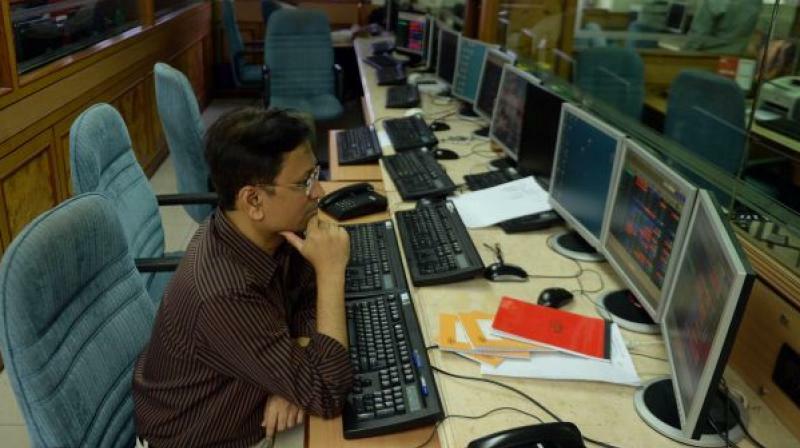 Mumbai: The BSE benchmark Sensex dropped 200 points in early deals on Monday on negative global cues, widening current account deficit as rupee continued its fall to hit a fresh record low. The BSE 30-share barometer fell by 206.85 points, or 0.54 per cent, to 38,182.97 in early trade. The laggards include Yes Bank, PowerGrid, Kotak Bank, ONGC, Hero MotoCorp, HUL, HDFC Bank, ICICI Bank, HDFC, Tata Motors, Sun Pharma and Asian Paint Sun Pharma, Yes Bank, SBI, ICICI Bank, NTPC, ONGC and Maruti Suzuki, falling up to 2.12 per cent. The gauge had gained 371.51 points in the previous two sessions largely on value-buying in recently hammered stocks. The NSE Nifty index too shed 44.50 points, or 0.38 per cent, at 11,544.60. Brokers said weakness was seen in most Asian markets as investors were cautious amid fears of a possible escalation in the US-China trade conflict. US President Donald Trump on Friday threatened tariffs on a further $267 billion worth of Chinese imports. While, Beijing has warned of retaliation if the US goes ahead with any new measures. The rupee plunged to a new record low of 72.32 against the dollar by falling 59 paise in early trade, further dampening investor sentiment, they added. Meanwhile, India's current account deficit (CAD) widened to USD 15.8 billion in April-June this year as against USD 15 billion in the same quarter of 2017-18 in value terms, mainly due to a higher trade deficit, according to RBI data released Friday. Foreign portfolio investors (FPIs) bought shares worth a net of Rs 37.56 crore, while domestic institutional investors (DIIs) made purchases to the tune of Rs 942.45 crore on Friday, provisional data showed. Elsewhere in Asia, Hong Kong's Hang Seng shed 1.09 per cent, while Shanghai Composite Index dropped 0.63 per cent in their early trade. Japan's Nikkei too was down 0.04 per cent. The US Dow Jones Industrial Average ended 0.31 per cent lower on Friday.